petition: Tell pet food retailers to stop importing caged rabbit meat for UK pet food! 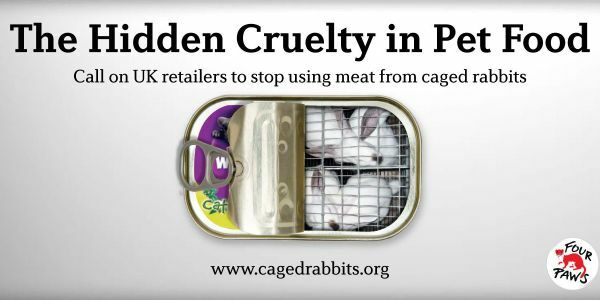 Tell pet food retailers to stop importing caged rabbit meat for UK pet food! recipient: To the CEO of Co-op and Lidl. Call on Co-op and Lidl. Rabbit meat from Europe’s caged factory farms is being imported into the UK for use in pet food. The conditions in which these rabbits are farmed do not meet the animals’ welfare needs. The rabbits spend their whole lives in small, shared wire cages which constrict their movement. They remain in these cages until they are sent to be slaughtered. As happens in all factory farming systems, many of the animals die before they reach the age to be slaughtered, due to poor hygiene and the spread of disease within the crowded outbuildings. Data provided by DEFRA shows that meat from approximately 300,000 rabbits are imported to the UK each year from factory farms in other parts of the EU. FOUR PAWS UK is confident that pet owners are unaware of the cruelty behind the pet food they are purchasing. We aim to stop the import of caged rabbits to the UK, and are calling for UK retailers to commit to stop using imported caged rabbit meat in their products. Sign the petition today and tell your friends, family and anyone else you know. As CEO you have the power to ensure that the cruelty in rabbit farms across Europe does not reach the products your company makes or sells. Such a move would ensure that you are not selling a hidden cruelty to your customers. FOUR PAWS UK has researched the number of rabbits being imported to the UK with an approximate figure of around 300,000 provided by DEFRA. As CEO, you can help reduce this number and effectively help end the barbaric treatment of rabbits across Europe. Please act to stop using rabbit in your pet food products and only source / manufacture pet food that is ethically sourced and uses ingredients that are a by-product of the human food chain and farmed in high welfare systems. Please take a stand for animal welfare and moral responsibility. Such a stand would be a mark of true leadership and commercial foresight. Show some heart, show your standing, and set an example in line with consumer demand. Four Paws and all the signatories of this petition.